Ludhiana/ Chandigarh: According to media reports, arrested Damdami Taksal (Mehta faction) persons have confessed their involvement in attack on Sikh pracharak Bhai Ranjit Singh Dhadrianwale. Notably, Bhai Ranjit Singh Dhadrianwale’s conclave was attacked near Ludhiana on May 17, in which Bhai Bhupinder Singh Dhakkiwale was shot dead. 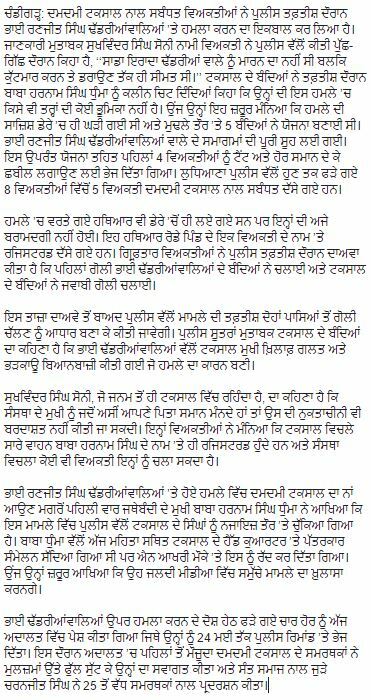 According to Punjab Tribune Sukhwinder Singh Soni, a follower of Damdami Taksal who resides at Mehta based headquarters of the Taksal said that they did not intended to kill anybody and maintained that their initial plan was to beat-up and threaten Dhadrianwale. Soni reportedly maintained that Bhai Ranjit Singh Dhadrianwale’s men had started firing and the attackers had fired in reply. Punjabi Tribune notes that the police have now started investigating the possibility of firing from both sides. As per media reports, the arrested persons told police during investigation that the conspiracy to attack Dhadrianwale was hatched inside the Damdami Taksal (Mehta) but Taksal Chief Baba Harnam Singh Dhumma was not aware of it. They reportedly said that the reason behind the attack was Bhai Ranjit Singh Dhadrianwale’s recent statements against Baba Harnam Singh Dhumma. Notably, both Baba Harnam Singh Dhumma and Bhai Ranjit Singh had been issuing statements against each other. The audio/video clips available on YouTube and Facebook show that both the pracharaks were using low-language against each other.